If Gin were a friend, I couldn’t call him an old friend. Like most people I’ve always assumed Gin was a rather old bore, to be consumed by middle-class/middle-aged Daily Telegraph readers. Stretching the analogy comfortably beyond it’s breaking point I would consider Lager an acquaintance from my under-age drinking days, Beer is clearly a life-long friend I met at University and Martini and Lemonade is a rather embarrassing school friend that I bump into occasionally. Anyway today (14th June) is apparently World Gin Day. I must admit a certain amount of curiosity as to why/how today was chosen, but I’m prepared to overlook this tiny detail. To celebrate this event I am attempting a little piece of Alchemy. Rather like the Alchemists of old I am attempting to to a rather base (and boring) Marlborough Gin into an Elixir of the Gods, or at least a pleasant Rose-petal flavoured gin. As an aside, I have the problem that as soon as I mention an Elixir of the Gods I get it confused in my little brain with Ambrosia, the food and drink of the Greek Gods, which morphs in my head to the range of ready-made custards and rice-pudding produced by the British food company of the same name. At which point I realise how horribly wrong my analogy has gone. 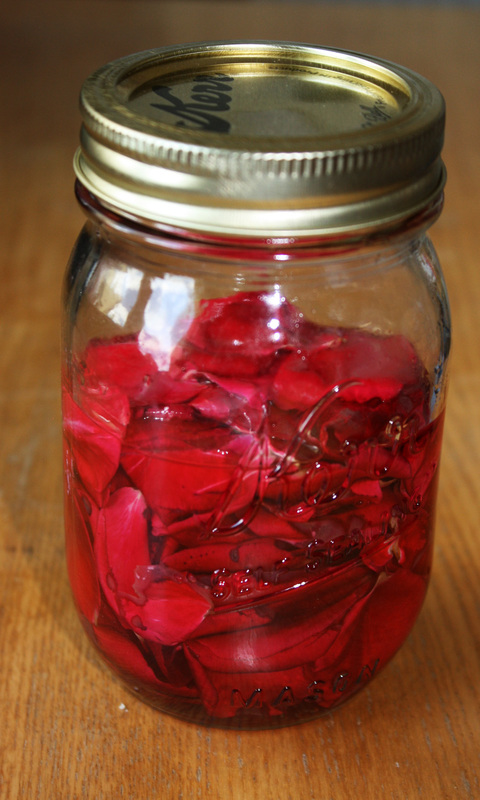 Production of this elixir is rather simple, take a clean jar, add some freshly picked and washed rose petals and wait a couple of days, if you like stronger flavour repeat this process with a new batch of rose petals. Note: Do NOT use old tomato chutney jars for this process. I ruined the first batch of gin this way. It’s a horrible end that no gin, even Marlborough gin, deserves. Below is a shot of this magic process. Having just sampled the resulting brew, as a G&T, I can recommend it, especially with a slice of lime added for contrast. I doubt Ill make my fortune this way, but at least it makes a good party trick. Enjoy. This entry was posted in Gin, Rose Petal Gin and tagged Gin, Gin and Tonic, Marlborough Gin, Rose-Petal Gin, WorldGinDay. Bookmark the permalink.